I have been wanting to try this for ages, finally I saved up enough crayons from restaurants, and goody bags . This took a while , it was a true nap time creation from the time my son fell asleep until I heard “Mama I’m up” almost 3 hours later. So block off some time without little hands before starting this project. Gather your materials. 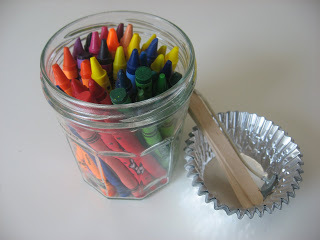 You will need many crayons of various colors, something to melt the crayons in ( I use aluminum cup liners in a ratty old cake pan- the wax does leak through sometimes) , some popsicle sticks for stirring, a recycled jar and a candle wick. Start by setting your oven to 220-265 I am impatient and melt them at 265 but many people have said that that is too hot and they had smoking, so my suggestion is to start low and adjust accordingly. Peel the paper off the crayons and break into small pieces. I used 7-10 crayons of each color for my candle. 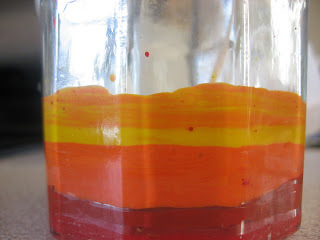 Put the wick in the jar and hold onto it as you pour the melted crayon into the jar. 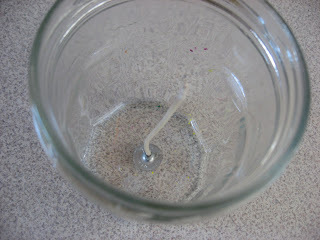 If I had had a longer wick I would have wrapped it around a popsicle stick and laid the stick across the jar to keep it in place. Let the wax set before adding the next color. This is what happened when I didn’t wait long enough. Keep adding and letting the color set. Trim the wick when all colors are added and set. Update – I lit the candle and it burned well for about 15 minutes, after that the flame got tiny tiny . The smell was fine, although I admit to liking the smell of crayola! 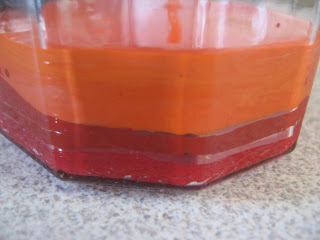 Overall I would do this as a pretty decoration, exploration about melting and color mixing and not to make a candle to use in emergencies ! Does the candle smell like Crayola? Not that that is a bad smell… love the smell of new crayons! I am working on a list of things to do with glass jars and I would love to link you! I don’t know and with anything you are lighting I would be nervous to be wrong. I still have mine and use it for decoration – it’s never burned well. 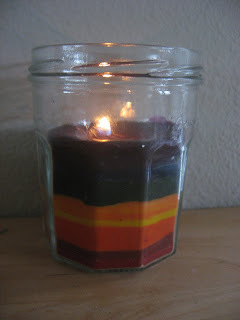 My friend makes these all the time, and she melts actual wax for candles and mixes the crayons in. You can get the wax at stores hobby lobby and they turn out really cute! I think that’s the way to go – this was an experiment more than anything and it’s cute but it’s not really functional. Oh that is SO cool!! I’ve melted crayons to make coloring discs, but this is much prettier! Neat idea but I’m not to thrilled about the crayon smell. LOL. Now a playdough smelling candle that would be cool! LOL. Oh i playdoh smelling candle would be so cool! VERY cool idea! I will have to try this! Love, love, love this! I’ll start saving my crayons. 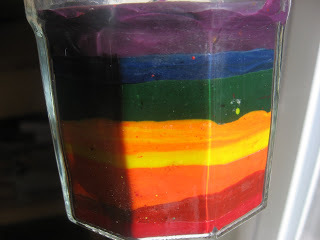 You’ve probably have done this, but melting crayons in a mold to make a rainbow crayon is fun, too. We made heart crayons last year. Do crayons really “burn” well? I’d love to know if it is worth the effort. I love playdough smell too ! I haven’t burned it yet, I want to give it a full day to really set. I am going to try it later today, and I will update. What a fun idea. And so smart about using the foil liners. I made chunky crayons from broken ones the other day. I didn’t even think to line the pan and now it is no good for cooking. Thankfully it wasn’t too great to start with. its a great idea but crayons don’t melt as candle super well. You get uneven melting that and the wick size is off for the size of candle. 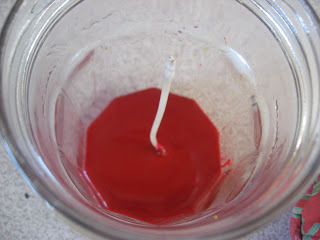 They are great to add to candle wax for color. plus you get that crayola smell. Smells not bad at all, it burned well for the first 15 or so minutes but now it’s a tiny blue flame, it’s still going…. but barely. How fun! Goodness knows that we have enough slightly-used kids’ meal crayons lying around! I wonder if it would burn better if you mixed in a bit of paraffin? I have left you someover at my blog!!! First of all you are so blessed…your kiddo naps for 3 hours. Wow! I have two girls, K’Lee 2 years old and Ellie 7 month…I might get 2 hours (on a good day). I just want to thank you for all these wonderful ideas! I just became a stay at home mom (was an engineer)to have more time with them. However, he is also the worlds worst night time sleeper, so when he naps well I am extra blessed! LOVE IT! What a great activity for Earth Day coming up. 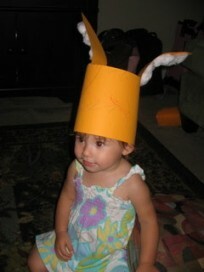 And I have a ton of old crayons that I need to do something with… perfect! If I did this again , and wanted it to burn well… I would use mostly parafin and mix in the crayons for color , and add in some scent! It seems obvious now, but I would never have thought of these as a way to recycle crayons. My immediate concern would have been the fumes that the melted crayon might release. but I guess you’re still alive, right? .-= Boardwalk@ Recycle Christmas Cards´s last blog ..Recycle Greeting Cards for Arts and Crafts =-. Definitly a great way to recycle old Crayons LOL. You can always ad some essential oils to make it smell nice. What a terrific idea! 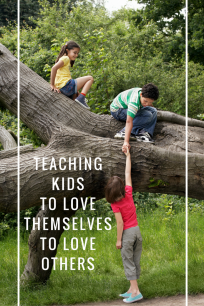 I’m going to try that with my boys. I think they’ll love it! Wow, this is a great idea. I will have to include it in my next party. 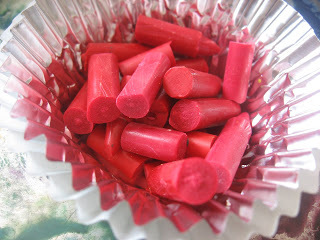 When I used to make a lot of candles I always used crayons instead of commercial dye discs to colour the wax. 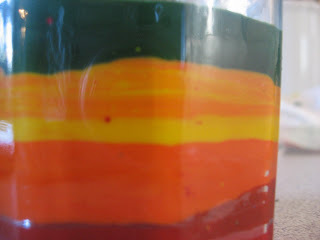 You melt crayon in with the plain candle wax to colour it. 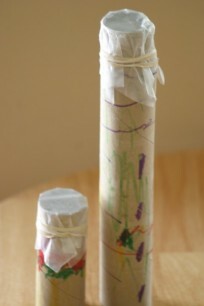 The crayons go further, it makes better (and safer) candles, and I’m guessing it’ll smell better too. Have fun! Thanks! This was really one of those ” Hmm I wonder if it will work?” Years later we still display the candle but never ever use it. Just stumbled across this, great idea. We’ve got so many left over crayons and this is great thing to use them for. My kids will love making this. How about using an actual candle rather than a wick? Secure it and pour the crayon wax layers just as you mentioned. When you light it you will be burning the candle and not the crayon wax. Would still look the same. Just a thought. Have you tried to add some candle scents to change tot smell. and maybe a little beeswax to help with the burning out fast problem?